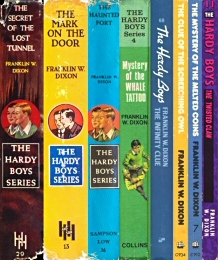 Out of the 190 titles in the original Hardy Boys Mystery series (published in the US from 1927 to 2005), 89 stories were issued in the UK between 1950 and 1992. All but two of the novels were released by Collins and their derivative imprints; therefore these pages are, by default, organised using that particular numbering system. However, to facilitate browsing for individuals who may only be familiar with the US progression, it is possible to switch between the two systems using the buttons below. Note: US #88 Tricky Business was not published in the UK (unlike US #89 and US #90); consequently, this title does not have a dedicated gallery page.